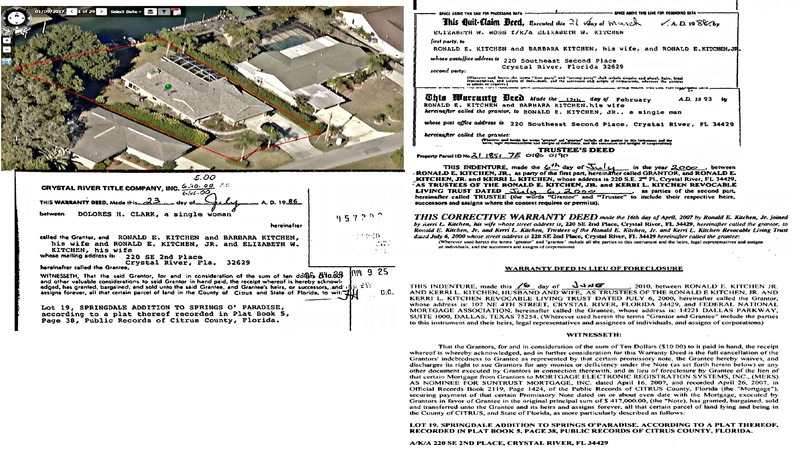 Below are the documents that paint the picture of the up and downs of the unfortunate misadventures of Citrus County Commissioner Ron Kitchen Junior’s property at 220 SE 2nd Ave Crystal River FL. The saga began with the 1986 original purchase and continues through the many years of up and downs with the foreclosure in 2010 after the property had a mortgage of $372,000! So where does the swagger come from? But no fear he’s learned his many lessons by mismanagement of his family home, Citrus County is in good hands. The pitfalls of political parties blaring problems, cover-ups, secret meetings, flying to Tallahassee grooming for state politics, in essence political parties have all the nuances of secret societies, hidden winks, smiles and the like. Rest at ease, all is well.